The vision of transforming the North Star House into a cultural event center and museum open to the community is now a reality. The North Star Historic Conservancy is pleased to announce that the North Star House is now open to the public every Tuesday and Thursday from 10am – 1 pm, and every Saturday, May through September, 9am until noon. Come view this iconic landmark with your friends, family, or business associates. 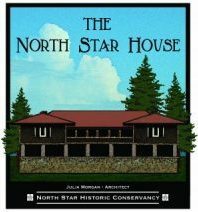 During the “open house” hours, history docents will be on hand to give informal tours and answer questions about the North Star House, its nationally known architect, Julia Morgan, and its first inhabitants, mining engineer, Arthur DeWint Foote and author and artist, Mary Hallock Foote. On Tuesdays and Thursdays the construction crew will also be available to explain the renovation plans and process. The North Star House served as the social headquarters of the North Star Mine, and was where the public and investors were invited to meet and greet. This special example of California Craftsman Style architecture is on the National and the California State Historic Buildings Registers. Visitors are welcome to sign the Guest Book and to learn about becoming a Volunteer. Students of all ages are welcome! The North Star Historic Conservancy Board of Directors is pleased to announce the creation of a new project to honor the legacy of past Board member and House Ambassador, Peggy Levine. The Board has dedicated a key portion of the 2nd floor of the North Star House to be restored and used as “The M. W. Swan Levine Gallery”. Her vision was that a large room and central hallway on the 2nd floor of the historic North Star House be devoted to display the work of highly talented, Nevada County resident artists from a wide variety of backgrounds. The Gallery, named in Peggy’s honor, would also host a number of exhibitions, programs and events. As a venue tied to the North Star House, the Gallery will bring the public closer to the wonderful world and History of Nevada County art; one of Peggy’s many goals in her life. Our vision and hope is it would further cultivate our vibrant arts environment and preserve the community’s artistic heritage. To achieve this vision, the Board and the Levine family will need your help. In order to open the M. W. Swan Levine Gallery on the 2nd floor, a number of improvements will need to be made to The North Star House. Though great strides have been made on the lower floor to open it for public use, the 2nd floor is largely unfinished. To allow public access to the 2nd floor, such items as fire sprinklers, an elevator and utility upgrades will be necessary. The restoration of the 2nd floor and the opening of the Gallery can be done with your help. Peggy was always one to push us to new heights, so our Board and the Levine Family are asking those who admired this incredible lady to help us in this task. With community support, this Gallery will open its doors!